Jesus’ ministry is now over. The Incarnation, the en-fleshing of God is also coming to an end as Jesus moves from the last supper to the garden where he will be arrested and the events of the Passion will begin to unfold. Before this though Jesus has performed one more sign and then interpreted this sign for his disciples. In many ways this final sign – the foot washing – brings together all of the other signs along with Jesus’ entire ministry. This sign helps us all to see that it all comes down to one thing: LOVE. Earlier in the Gospel we had met Nicodemus who was struggling to understand what in the world Jesus was doing. Jesus told him – “God loves the world so much that those who believe, those who are in relationship with God will remain – will Abide – in this love of God’s forever!” Now the sign, the foot-washing, is a sign of this love that Jesus, God en-fleshed has for the disciples and for the world. “A new commandment I give you,” Jesus told his confused and scandalized disciples – “that you love one another, just as I have loved you.” The point – God loves the world – God loves the disciples – God loves you and me and all of God’s creation more than we can ever possibly comprehend. And this is what we are called to do in response as well – to love others, as God has loved us! And so, after a prayer Jesus goes out to the garden. And here begins the events of the passion found in chapters 18 and 19. This narrative can be divided into 3 parts in John: the arrest, the trial and the crucifixion, which includes the burial. First the arrest - Judas comes with a huge crowd of soldiers to arrest Jesus. Judas is the thief, the bandit Jesus referred to in the Good Shepherd discourse in chapter 10 and who now stands outside of the sheepfold as Jesus, the Good Shepherd, will protect the sheep, his disciples, who are inside the sheepfold. “Who are you looking for?” Jesus asks, “Jesus of Nazareth,” comes the answer – And Jesus responds with these words: “I AM.” There is no “he” in the Greek – Jesus does not say, “I am he.” He only says, “I AM” which as we know from Exodus and from Jesus’ use of the phrase earlier in the Gospel is the name of God. And so here at the end we are all reminded once more that the “Word had become flesh and dwelt among us” – that Jesus is God en-fleshed. Judas and the soldiers cannot stand before the great I AM and they fall to the ground until finally they are able to arrest the Good Shepherd and as predicted, the sheep scatter. Next comes the trial, but whose trial is it in John? Well, it is Jesus’ trial for sure, but not only Jesus’ trial. Peter’s is on trial too, and by extension so are we, we believers and disciples of Jesus are also on trial. “Are you not one of that man’s disciples?” The maid asks Peter. “I am, not!” he responds. And this response is the mirror opposite of Jesus’ response earlier. Not only that but Peter is denying not only his status as a disciple of Jesus, but he denies his relationship with God. Why? Fear! Peter is afraid. At the same time inside the council chambers, Jesus is questioned by the Sanhedrin, the Temple authorities and the High Priest Caiaphas. They struggle to understand his teaching, but a God that loves us so much, and so unconditionally is threatening and incomprehensible to those who are in power and those who have vested interests in power, wealth and control. So, they question him, but they end up going in circles. Finally they take him to the Roman Proconsul, Pontius Pilate, who is able to understand Jesus even less. “Are you a King?” “What have you done?” Where are you from?” “What is truth?” Pilate is confused. Jesus is not the usual hate-filled revolutionary that Pilate is used to dealing with. There is an unusual gentleness, there is a love and there is an authority that Jesus embodies that confuses Pilate. “I find no case against him,” Pilate finally tells the Temple authorities. “No! We want Barabbas!” comes the response. “Crucify him, crucify him!” comes the response. Pilate stands before the people with Jesus at his side – “Ecce homo – Here is the Man! Here is your King!” he proclaims. “We have no King but Caesar!” And with that the crowd has confessed that they have placed their trust in power and wealth and hate and exclusion and in this way they have denied their relationship with God. Why? Fear! And John tells us, Pilate hands Jesus over to be crucified – why? Fear! And sitting around a charcoal fire, Peter denies Jesus two more times – “Are you one of this man’s disciples?” He is asked, “I am not!” comes the answer a 2nd time, and then a third. Peter has joined the crowd out of fear in denying his relationship with God. But this will not be the last time that Peter will be asked to make a commitment while he is sitting by a charcoal fire, by the way. Where do we stand? John answers the question for us in a way we might not want to acknowledge: we stand with the crowd – we stand with Peter. We would like to think that is not the case, but John knows that it is the case. We are all susceptible to the pressures of fear, to the pressures to conform, to the lure of wealth and greed and power and hate and we act too often out of this fear. But fear is a liar – fear destroys relationship – fear destroys love. But fear will not have the last word. Because there is forgiveness and there is always a chance to place fear behind us and move forward, as we will see. For now though we have moved into the last part of the Passion. 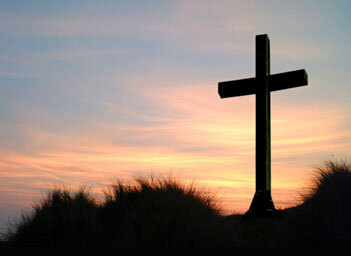 In John Jesus carries his own cross beam to the place of crucifixion – a place that John tells us will become a garden. And there he is crucified! At the place of crucifixion he is surrounded by the whole world – soldiers from all over the empire, Judaens, the authorities – the whole world is assembled to witness the crucifixion of God incarnate. And a sign is placed over his head – Jesus of Nazareth, the King of the Jews written in Hebrew, Greek and Latin, languages that also represent the entire known world. The world that God so loves! And the last thing that Jesus does is to create relationship – “woman here is your son, here is your mother” Jesus speaks from the cross to the Beloved Disciple and his mother. For this is what God always does – create relationship. This is what love does – create relationship. Oh, and who is the Beloved Disciple, it is you and me! We are Jesus’ beloved disciple, we are the disciple who Jesus loves. And for us Jesus, God incarnate is always creating relationship, out of love! And then the one who had given the woman at the well the Living Water speaks these words – “I thirst” and then he proclaims the end of the Incarnation – “It is finished.” And with that he breathes his last breath. And the incarnate, en-fleshed God now hangs on the cross dead. His side is pierced but his legs are not broken. And he is removed from the cross and lovingly cared for by Joseph of Arimathea and Nicodemus who anoint the body and place it in a tomb. No? No, not the end! Fear will not be victorious! Hate will not be victorious! The power of broken relationship will not be victorious! The grasping for power and wealth at all costs will not be victorious! Death will not be victorious! Jesus is entombed in a garden – yet, another garden. And soon, in three days to be exact, this garden is going to blossom and boom and yield life and relationship! This garden will allow love to be reborn and to flourish – because nothing can destroy God’s love. Nothing can stand between God’s love and those whom God loves.